The thing I linked to yesterday explained it well. Warning: a bit of profanity. Relevant section: This is from a random guy on the internet, so cmiiw. Not a very good explanation, but he gets some parts right. The liquidity issue is somewhat significant - meaning if in fact you decide that the 2 options are truly worth the same amount to you mathematically, you only have full access in one of the scenarios. The real reason is because the annuity is not necessarily competitive. You could easily argue that this type of annuity is not a good investment generally, but even if it was, you very well might be able to take the cash and buy a slightly better stream of income (or buy the same stream for less and hold the difference) if you preferred that method of payout. The states don't handle the annuities themselves, as that poster mentioned. They put these policies up for bid to the insurance companies who have annuity businesses. His 4.5% is actually totally off. Based on the $900 sum of annuity payments and $558 cash value numbers quoted on the Powerball website right now, the implicit rate of return on the annuity is 2.97% (assuming no built in fees or loads). Because it's not a completely open market, you're likely to do better actually shopping around for that very same annuity. If you're even having this discussion, you're probably not like that majority of winners. Give 100 million each to a handful of good asset managers. Keep 100 mill in the mattress (literally/or couple of bank accounts) and call it a day. The whole point is not to worry. Oh, and hire someone to handle maaser and to manage the foundation. I've never met any of these "majority of winners" but I always understood the statistics to mean that while most people have plans to be responsible with the money, actually winning makes you go crazy. There aren't any stats on the "majority of winners". Certain winners have blown their winnings and some of them are documented. Most reasonable, middle-class and higher individuals would probably be able to "handle" that kind of money. 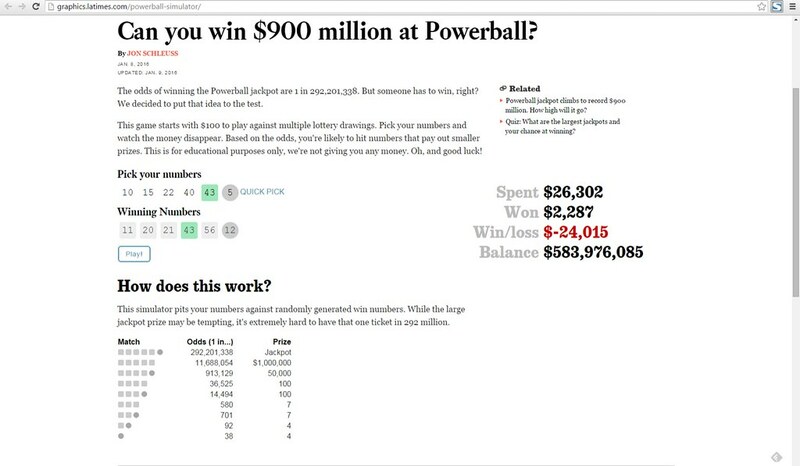 If it hit 2 billion would it be worth it to buy all 292 million posiible numbers to guarantee a win ? Been done (at least effectively) on smaller lotteries. Maaser? I would think about 70-80% should go to charity. I can't imagine that would apply here.